Last Tuesday, 29 August, Kakiata Tonana, Japanese Teacher at MTC, was honoured for teaching the Japanese language and culture at MTC for more than 10 years. 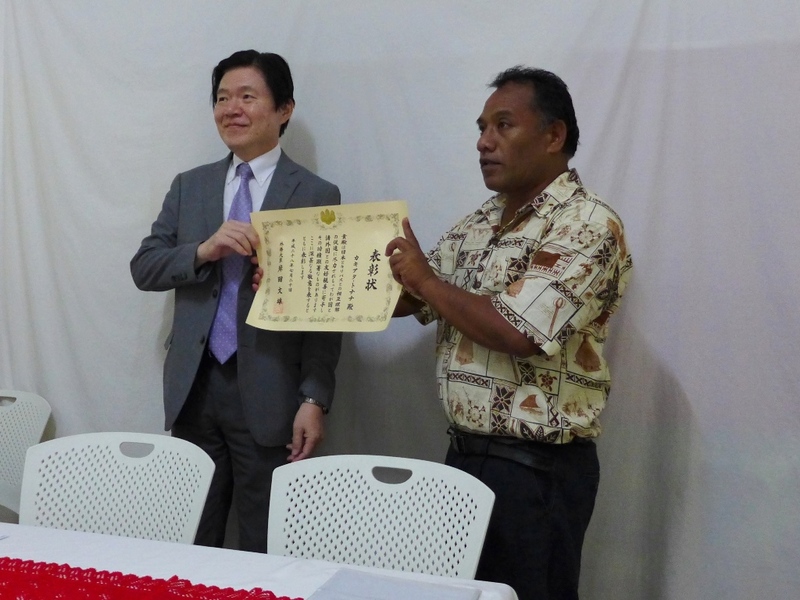 Masahiro Omura, Japanese Ambassador to Kiribati, presented the award for “meritorious contribution to promoting mutual understanding between Japan and Kiribati” on behalf of the foreign minister of Japan. Kakiata started his seagoing career in 1993 and worked for more than 10 years on Japanese pole-and-line fishing vessels. In 2007, he started teaching Japanese at the former FTC, in 2012 he went to Japan for further studies and completed the “Short-Term Program for Foreign Teachers of the Japanese-Language”. Japanese language training is a compulsory class for MTC’s FVP trainees, as the working language on board Japanese fishing vessels is Japanese only.